Every spring and fall I like to give our windows a thorough cleaning inside and outside. 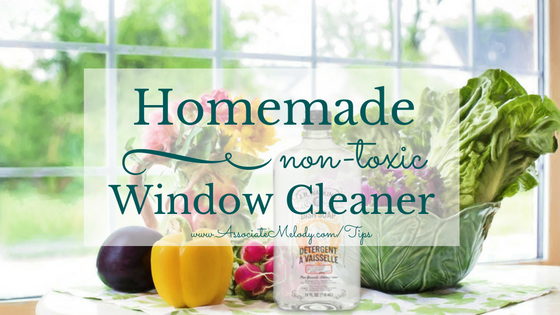 I’ve used all sorts of cleaners over the years and have found this homemade window cleaner is the most effective, it’s inexpensive, easy-to-make, and best of all it’s non-toxic. Washing windows may not seem like a potentially dangerous task unless you fall off of a ladder. But did you know there are potentially harmful chemicals such as solvents in commercial window cleaners? Every time you use them you (and your family) are inhaling toxic chemicals, getting them on your skin, and putting them into the environment. Not to mention, commercial window cleaners rarely deliver the streak-free results they promise. Homemade recipes for window cleaners are not new; people have been washing glass windows and mirrors long before commercial sprays were invented. But homemade window cleaner is a novel concept to many in this generation. This is one of those times when using Grandma’s tried and true methods is the best solution. Below is an inexpensive, easy-to-make recipe for an effective window, mirror, and glass cleaner. You probably have some of these ingredients on hand. If not, these products are inexpensive and diluted with water so they last a long time. Add all ingredients in a trigger spray bottle, replace sprayer, and shake to mix. Spray on windows and wipe with a soft cloth, then use a second clean, dry cloth to polish dry. I always have a bottle of this spray and wipe window cleaner mixed so it’s ready for my weekly cleaning tasks, it works great for windows, glass, appliances, and mirrors. Outside windows tend to get dirtier so when I wash them I like to mix a small pail of cleaner. Soak a sponge or cloth in this solution and apply liberally to windows. Use a squeegee to remove the excess cleaner and wipe dry with a soft cloth. Simply using soap and water is also an option, although I don’t find it as effective. Vinegar is the secret ingredient responsible for those streak-free, sparkling, clear results we all want for our windows and mirrors. My favorite liquid soap to use is Watkins multipurpose degreaser and cleaner, it’s concentrated and replaces dozens of cleaners and stain removers, you can learn more about all the uses for degreaser here. Since I’m usually in the kitchen when I make this I often use Watkins dish soap and find it’s just as effective, and it adds a delightful touch of scent. Another option that smells nice is 1/2 teaspoon Watkins liquid castile soap. I keep forgetting to try this one. Whatever soap you use, be sure to choose one that is environmentally friendly. Choose a cloudy day, windows should be cleaned when the sun is not shining on them. If windows are warm and/or in direct sunlight, glass cleaner (homemade or commercial) will be likely to leave streaks or fogginess on the glass. Using too much vinegar may cause fogging so if this happens simply add more water to your cleaning solution. Using too much soap is often the cause of streaking so if that happens to you add more water to your cleaning solution. If the outside glass has mineral buildup from sprinkling your yard spray it with Watkins citrus tub and tile cleaner and leave the cleaner on to work for 10 minutes or longer before you clean it. Don’t worry if it dries before you get back to that window. 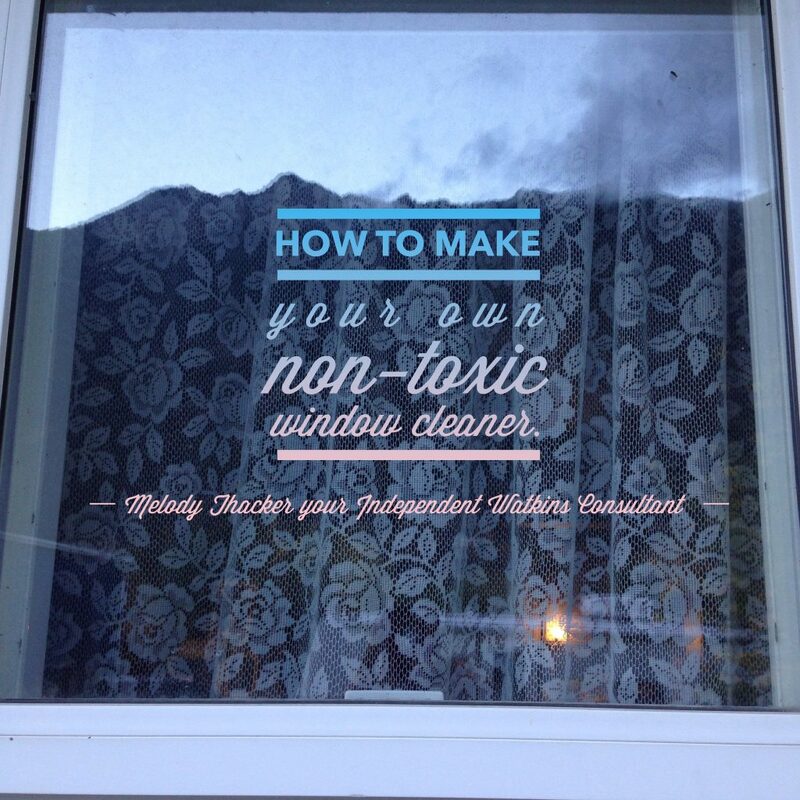 I hope you found this homemade, non-toxic window cleaner recipe and tips helpful. I’d love to hear from you so comment below and share your thoughts. Are you interested in more natural, non-toxic cleaning solutions and tips? Subscribe to my blog to receive your free copy of the All Natural Cleaning Guide and other helpful e-books, recipes, and tip sheets. The subscribe form is right in the sidebar, you’ll also be the first to know when new recipes and tips for your life are published here.